For those of you that have been thinking about getting a brushless motor for your 1/18th scale truck, this review should help make up your mind. We have been testing the Mamba brushless packages (motor w/speed control) and they have really gone above and beyond our expectations. We tested the setups in both the Hot Bodies Minizilla, and the Team Associated RC18T. Our charts were all done with the RC18T to keep things good and consistent. The Mamba comes in four different packages. 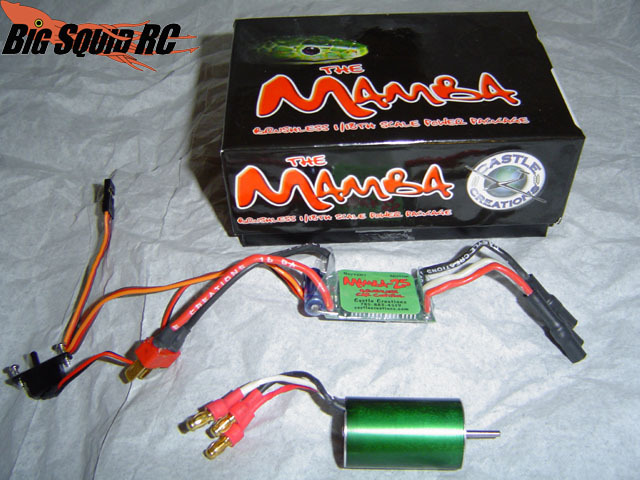 The Sport (4200Kv), the Performance (5400Kv), the Competition (6800Kv), and the Comp �X� (8000Kv). The differences are very big! So make sure you know what you plan on using the vehicle for, before you go out and buy one that�s either too powerful, or not powerful enough. Battery setup also makes a big difference, so keep that in mind, when thinking about what you need. The first vehicle to get the Mamba setup was the Minizilla. 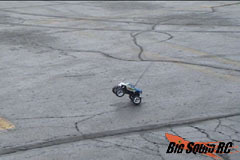 The Minizilla is a great little truck, it�s just a tad slow in stock form. We used a 13 tooth pinion gear, and went to town. The motor installed with no problems, the speed control sat nicely on top, and one of the better things about the Minizilla, is that the LiPo packs fit perfectly inside the rear battery compartment! 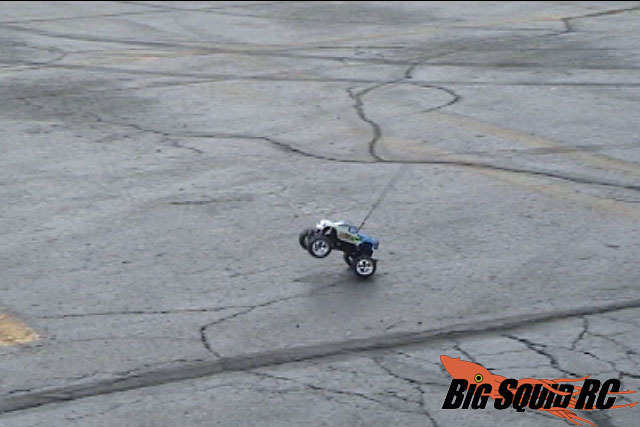 At the first squeeze of the throttle, the Minizilla was on it�s back! Doh. These motor�s are powerfull! 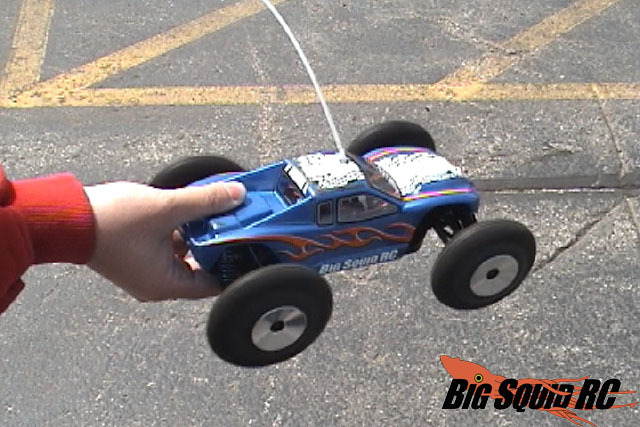 We tried most of the settings with the different motors, and different batteries, and found that the Mamba Sport Package(4200Kv) was perfect for this truck! Anything bigger caused serious control issues. The Sport was controllable, the speed was right on! (about 24 mph) I really enjoy this motor in the Minizilla. It took the truck from �kinda fun� to �a real blast� in my yard and driveway. Another amazing thing about the motors, is that they have a ton of torque. I was able to easily back flip off a little ramp just by giving a small tug of the throttle. The rpm�s would easily flip the car in midair. You can see this in the video clip. 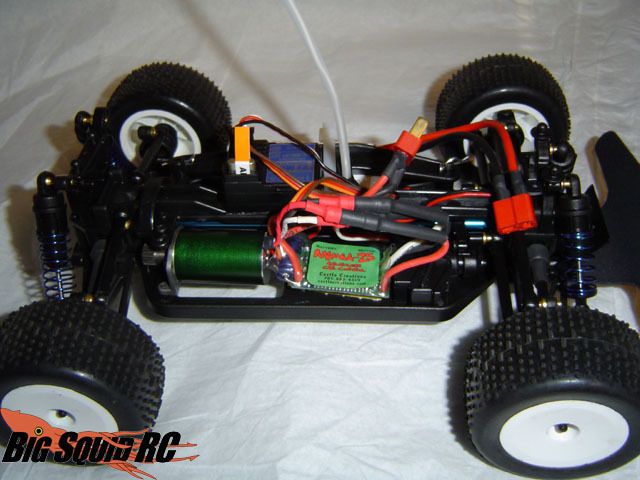 Next to get some new power was the Team Associated RC18T. Once again we had no problems installing the motor. We used a 15 tooth pinion gear, and also installed a motor heat sync. These things do get warm, and when your doing constant speed runs, anything helps! One of the only issues we had during install, is the Apogee battery packs don�t quite fit where the battery needs to go. We ended up jamming it in as best we could, and using zip ties to keep it in place. If this is going to be a permanant install, I'd suggest coming up with a solution that protects the battery a little more. 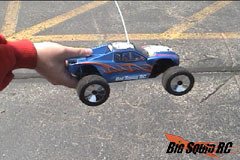 We have learned from our experiences with the Minizilla, to start off slow, and get used to the speeds and power. Since the RC18T isn�t as top heavy as the Zilla, we didn�t have to worry about ending up on our back when we took off. We tried stock and on-road tire sets, (didn�t have any foam) but all them had trouble gripping with the amount of power we were throwing at them. During our speed runs, we found out a few things about the 18T. The body really isn�t set up for these sorts of speeds. There just isn�t enough down force. We ended up removing our new wide front bumper because at 50mph it was acting like a wing! As soon as we were hitting speeds of over 50, the car would just flip and roll. We did dozens of runs with all the setups, and made a nice chart for you to compare. 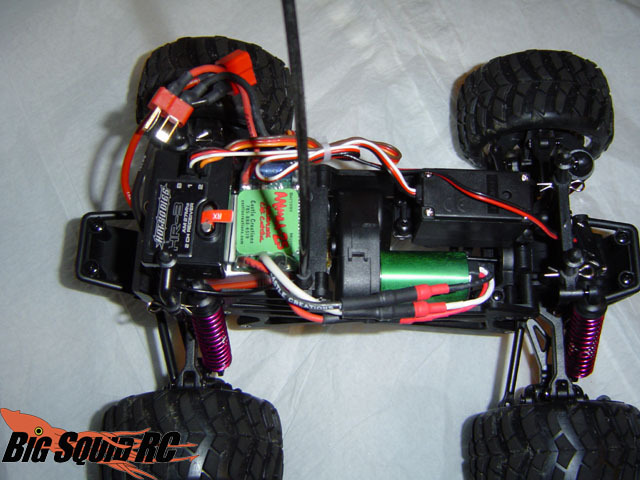 With the 11.2v LiPo the Comp X is basically un-drivable. The tires would balloon up, and things were spinning so fast, the car just had a mind of it�s own. It was very tough to drive, and if I got a tad out of line, I�d have to release the throttle, because there is no steering at these speeds. We had two types of runs with the Comp X motor. The first type was �whew� , and the second was �uh-oh�. Either we made it down the run or we didn�t. With a good set of foam tires, and a better body, I�m pretty sure 60mph runs are very do-able. As you have seen in our videos, we like to attend a few RC drag races every year, and the RC18T with the Mamba Competition or Comp X package will be our choice to race! We put the 61 mph in parentheses because we only hit it once. I think with a better setup and tires we could keep it up there. All the other speeds we could consistently hit. We had the most fun with the Competition (6800Kv) motor because we were just on the edge of loosing control. Ok, back to the review of the product huh? Once I got the hang of changing the options in their menu, I was happy with it. There was a bit of a learning curve, and trying to adjust menu options by sound isn�t really the best. I�d love to see some sort of display. Either a led menu, or a screen or something. Anything to help me out if I�m someplace where there is a little noise. The default settings were usually our best bet. There are all sorts of things you can set from Brake/Reverse type (including reverse lockout). Reverse throttle, cutoff voltage (to make sure you aren�t running on to low of voltage) Timing Advance, and starting power. We kept our starting power on low, because even that was way more then enough to be to fast! We messed around with the Timing Advance options a little bit, and it really didn�t help us much. We gained about 1 mph more speed on �Extreme� over Normal, but we also had much shorter run times, and a much hotter motor. Stick with normal, you�ll be fine! I really liked the braking and reverse options! I wish more ESC�s had these types of options. It can make it a lot easier on your gears, and really allow you to have a brake of your own preference. Good job to whoever programmed it! A lot of people talk about �cogging�. Cogging is when the motor seems to hesitate when you give it throttle. This can happen from a lack of power, or bad gearing. As long as we kept the vehicle moving, we didn�t have any issues. I did notice after doing a run, if I was on the brake coming to a stop, then gave it a little throttle, I would get this hesitation. It�s a little annoying, because you don�t want to be on the throttle when it does catch, and just trash the gears. All I would do is release the throttle, and give it a little juice a little slower the next time, and it was fine. I also really only noticed this with the faster motor, maybe it was just the way I was driving it. A quick note about the battery packs. We picked up 3 from Apogee, and they all performed great. 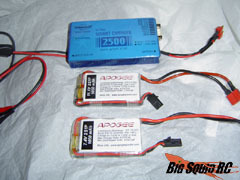 We had a 3 cell 830mah 11.1v pack, a 3 cell 1050mah 11.1 v pack, and a 2 cell 1050mah 7.4v pack. All the batteries worked great! It�s hard to believe the amount of power and run times that come out of these things! I�m a little bummed that they don�t fit so well in the 18T, but I�m sure with a little ingenuity you can come up with something! 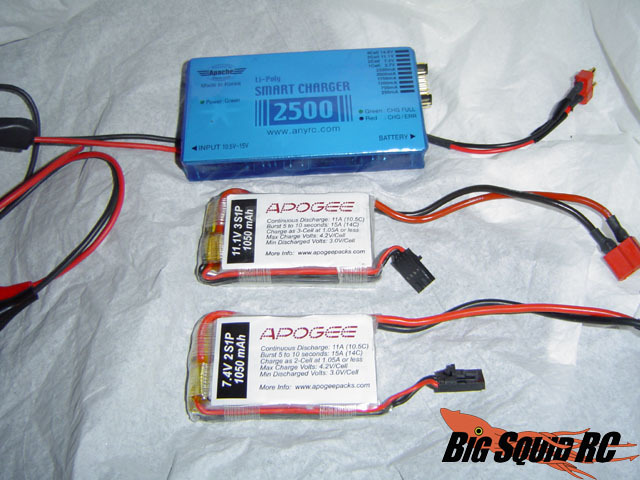 We also used the Apache 2500 Charger. When I first saw it, I was a little concerned. It�s seemed too simple, and it didn't cost much. Well it worked great! It charged the batteries just fine, the jumpers were easy to read and change (I�d still like a dial, but if it�s keeping the cost down, then it�s good enough) and the batteries never got too warm or anything. It even told me (with a little blinky led) that I had something connected wrong one time. If you are going to go brushless, I would definitely recommend checking out PFM Distribution and their Apogee batteries. To wrap things up, if your looking to bash, track race, or just want a little more power, the Mamba brushless systems are great, and the price is right! Just make sure you don�t buy too much power for what you want to do. If your bashing or track racing, stick with the Sport, or Performance packages. (maybe the competition package, but that will probably be too much power) If you are looking to drag race, and go straight fast, then look into the Competition or Comp �X� packages. Also of note, these things can really take a beating! I was flipping, rolling, and slamming at 50+ mph knocking the ESC loose from the velcro many times, and had no issues whatsoever. Make sure to use deans connectors! My only other complaint is that there are NO markings on the motors at all. Meaning there is no way to tell them apart. We had 4 of them here, and between all the tests, and all the cars, it would have been nice to have a quick way to know which was which. To solve this, I just took some tape, and wrote what motor it was and attached it to one of the wires coming out of the motor. The support that is provided from Castle Creations is great! They have been testing this stuff on most of the cars out there, and they are really nice to deal with. I'm a big fan of companies with good support! 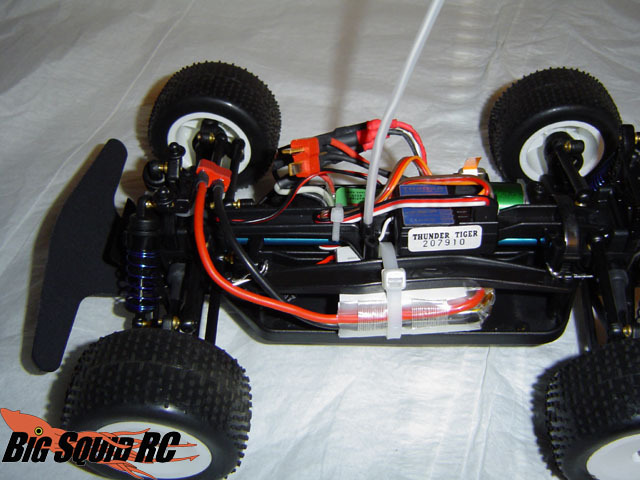 An extra note: We didn�t get a chance to try out the motors in the Duratrax Mini Quake, (I hope to soon) but we have heard that the gearing in the Mini Quake is really over geared! If you have a Mini Quake, try sticking with the gp1100 battery packs, and the deans connectors. You should still hit speeds around 35mph, but you may have to really experiment with the pinion/spur gear ratios to keep from tearing them up. Check out a quick video clip to see some of our speed runs over in our videos section, including 51 and 61 mph runs! Time to Bash 7/10 No problems with setup. It just takes a little while to get the connectors on, and everything installed. Workability 8/10 The menu system takes a little time getting used to, but there are some great adjustable features! Car Show Rating 9/10 While the motor/ESC in not really impressive looking, the speed sure looks good! Bash-A-Bility 9/10 Our test runs really gave it a beating, and the speed really adds a lot of fun to the bashing! 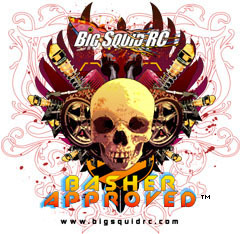 Big Squid Rating 9.1/10 Tentacles.. Besides the menu, there isn't much that could be better. If your thinking about going brushless, the Mamba is a great choice! !